(Nanowerk News) The history and origin of electrical stimulation for medical purposes, also commonly known as electrotherapy, is very peculiar and originates as early as 400 B.C. when torpedo fishes, taken live from lakes and streams and placed on a painful area of the body, were exploited to produce series of electric shocks (of ∼100-150 V) that were considered useful in reducing or controlling the pain. With the advancement of knowledge and with the ability to store electricity in batteries, electrical stimulation of tissues for various biological applications gained popularity in the 1800s; however, a general skepticism soon hindered its wide spreading until 1965, when the gate control theory of pain was introduced. Nowadays, it is well-known that cells and tissues are highly responsive to electrical cues, and the possibility to achieve an indirect stimulation, even inside cells, thanks to piezoelectric nanostructures is therefore extremely exciting, opening a wide spectrum of applications in the clinical practice. Nanostructured piezoelectric interfaces own the actual potential to offer beneficial environments for cell and tissue stimulation, and, at the same time, they introduce new scenarios into nanomedicine, where nanomaterials, owing to their 'smart' properties, are exploited as active devices rather than as passive structural units or carriers for medications. The research group of Gianni Ciofani at the Center for Micro-BioRobotics, Istituto Italiano di Tecnologia, was the first one to exploit piezoelectric nanomaterials to deliver an indirect electrical stimulation to neurons in a wireless modality. In their seminal study (ACS Nano, "Enhancement of Neurite Outgrowth in Neuronal-Like Cells Following Boron Nitride Nanotube-Mediated Stimulation"), nanotransducers were remotely activated through ultrasound and were able to induce Ca2+ and Na+ transients in neurons by activating voltage-gated membrane channels. In a new paper in ACS Applied Materials & Interfaces ("Piezoelectric Effects of Materials on Bio-Interfaces"), Ciofani and his colleagues review the most exciting findings on piezoelectric nano- and micro-bio-interfaces by focusing on fabrication methods, physicochemical properties, modifications for their exploitation in biological context (e.g., chemical functionalization), biocompatibility levels, and main effects on living systems. The authors provide an overview of innovative piezoelectric platforms, such as piezo-nanotransducers and 2D/3D piezoelectric bio-interfaces, which are currently used for biomedical investigations/applications and that have a good potential for being exploited in designing of futuristic medical device solutions or in the clinical treatment of degenerative pathologies involving excitable tissues. They also cover basic approaches to constitutive modeling, since it can be useful to describe both classical and bioorganic piezomaterials. 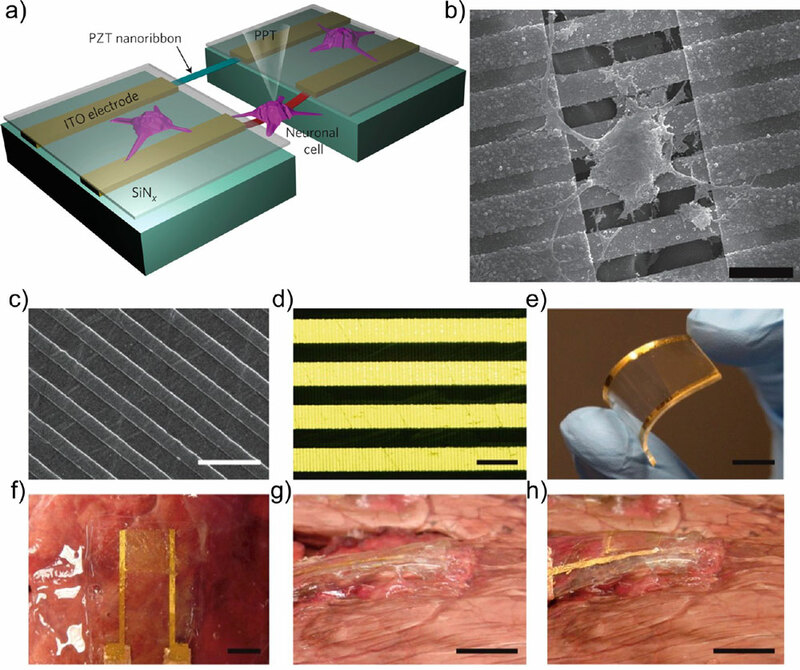 Summarizing their review, the researchers note that future applications of piezoelectric nanomaterials will range from self-powered artificial cardiac pacemakers, artificial cochlear epithelium and nanopiezotransducers for noninvasive deep brain stimulation, peripheral nerve regeneration, and bone tissue engineering. "Despite the impressive potential of piezoelectric nanostructures in biomedical field, further research efforts are still necessary for the evaluation of the nanomaterial biocompatibility, retention, degradability, accumulation in complex in vivo systems before actual exploitation in clinical context," they conclude their article. "These investigations can be focused on a huge variety of piezoelectric nanostructures characterized by peculiar chemical/physical properties and will allow for the identification of a 'golden standard' nanotechnology-based device/treatment to be adopted for human healthcare."